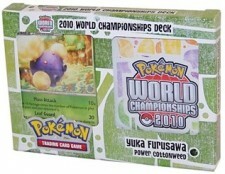 Despite being one of three decks to win Worlds last year, Jumpluff has seen very little play this year. This is most certainly due to the rotation that we experienced soon after, which took both Claydol and Night Maintenance out of the format, cards that were crucial in making Jumpluff a powerful force. Originally, I had thought what most people did: Jumpluff was no longer playable in anything other than league. Despite this, I put together a Jumpluff deck, not because I thought it was competitive, but because I believed (and still do) that it’s a really fun deck to play. After about 10 casual games with a list that had taken me 5 minutes to construct (it was only for fun-games, after all), Jumpluff is still a very good deck for this format as well. Immediately (aka three days later) I had started to test out a lot of different cards, techs and variants that I believed had a shot at working well in the deck. While some may argue that looking at lists from last format is a waste of time, I would certainly disagree. Even though a number of cards can’t be used in the deck I plan to construct. With Claydol no longer legal for tournament play, I knew that I wouldn’t be able to create a super-techy list that was also Turn 1 fast and consistent, so that pretty much eliminated the possibility of running Luxray GL or Shaymin Lv.X. Now that you know the list I’m using, I will go through the deck card-by-card and share why I included the card, what it contributes to the deck and why I chose that specific card count. Jumpluff is the main (and only) attacker of the deck, so it should be pretty obvious that we’ll be running a very thick line. The idea is to get a Jumpluff set up by Turn Two at the latest. The sooner you can get a Jumpluff up and running, hitting for high amounts of damage, the better your chances of victory will be. While Sunflora is only a a shadow when compared to Claydol, it is still a very good Pokémon that provides a powerful search capability. 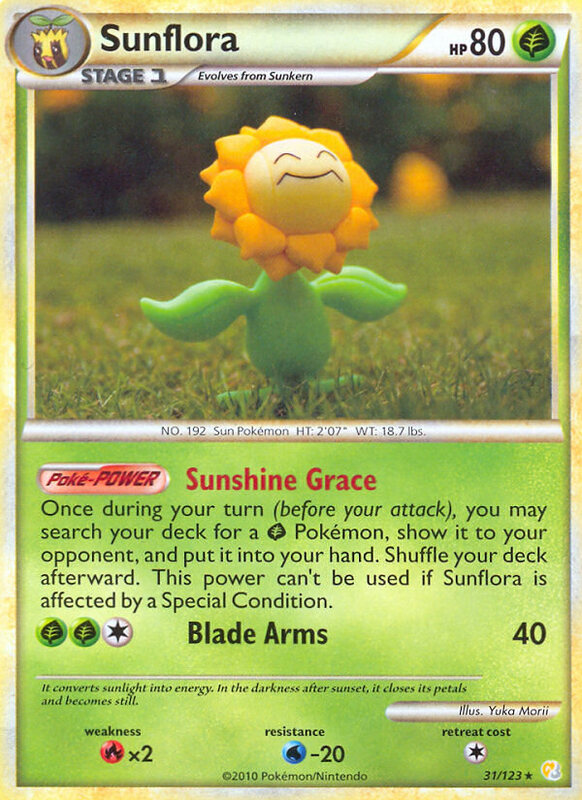 Without Sunflora, the deck would have a lot of trouble keeping Jumpluff’s coming mid- and late-game. One way that it is superior to Claydol is the lower Retreat Cost, making it less of a liability when facing decks that run “draggers”. Draggers: Pokémon such as Luxray GL Lv.X, Blaziken FB, Zangoose PL, Froslass GL, etc. that have attacks/Poké-Powers that can drag your benched Pokémon active. These cards serve two very important uses. 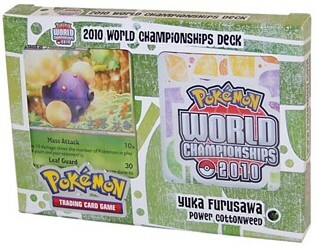 First and foremost, they provide massive draw power, making it much easier to get out an early Jumpluff. Second of all, Uxie and Unown R a great for helping you to fill up your bench as quickly as possible, which is very important in a Jumpluff deck. Also, one nice trick with Unown R that I have done quite frequently is to place it on your bench and just leave it there. That way, you can get Jumpluff’s damage count higher. 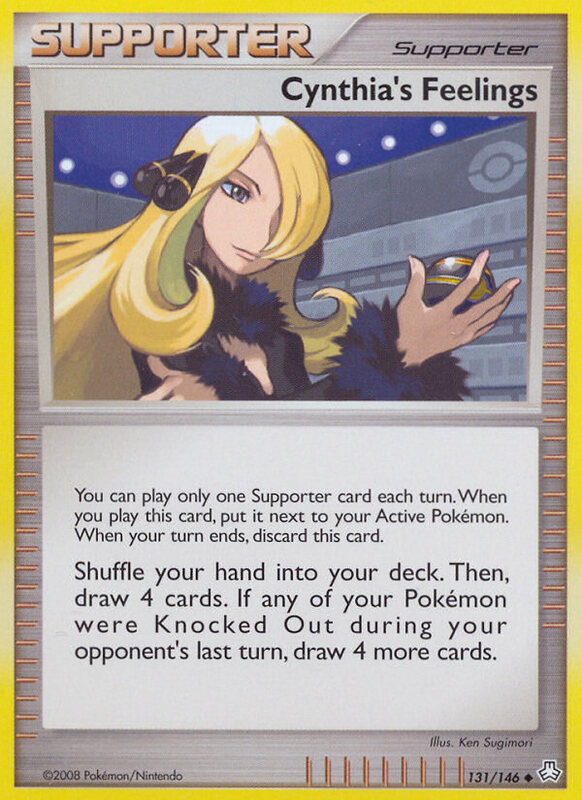 Then, when you need the bench space for a Crobat G or something else more important, kill Unown R to draw a card. While it is possible you could run into difficulty with TGI Power Spray, it usually isn’t a huge issue. The ideal starter of the deck, Smeargle provides a great boost of speed and really increases the chances of a Turn one Jumpluff. 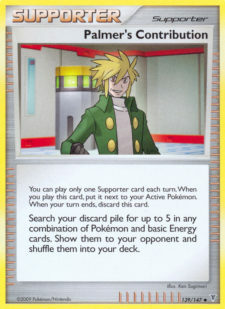 Also, in combination with Unown Q, it can be a useful card all throughout the game. Being able to not only see your opponent’s hand multiple times throughout the game, but being able to copy a Supporter card as well is just too powerful to pass up. Why I included these cards should be pretty obvious, they’re essential in getting out a quick Jumpluff, which in turn makes Jumpluff’s chance of victory much higher. Since Rare Candy is arguably more powerful since it allows you to skip the Stage 1 Evolution, I run the maximum allotted count while still including a heavy count of three BTS. Both Crobat G and Pluspower are very important insuring Jumpluff can OHKO a Pokémon each turn. The strength of this deck lies in its speed. For a single Energy, you have the chance of doing upwards of 100 damage. However, if you are unable to OHKO your opponent’s Pokémon turn after turn, you will quickly lose your advantage of speed and your low HP will be the undoing of you. When you were reading the deck list, you may have noticed the inclusion of three Rescue Energies. While it may seem like a bad idea to include Colorless Energy in a deck that can only attack with Grass Energy, I am confident that adding running three copies is essential. Most times I ran the deck, I was able to get a Jumpluff swinging by Turn 2. Having a Pokémon dealing upwards of 80 damage can be very difficult for your opponent to come back from, especially if they don’t get a desirable start. The odds are quite high that you’ll be able to score at minimum 1-2 KOs against most decks before they’re able to really start fighting back (apart from LuxChomp, perhaps). Now, by the time they can start going on the offensive, there is usually a turn or two that I call “The Calm Before the Storm” and it’s right before your Jumpluff will start dropping like flies. It is during this calm that placing down even a single Rescue Energy makes your chances of victory much higher. Being able to recover an entire Jumpluff line without using a Supporter card is really powerful. Also, if it is necessary, they can be used to Retreat Pokémon as well. 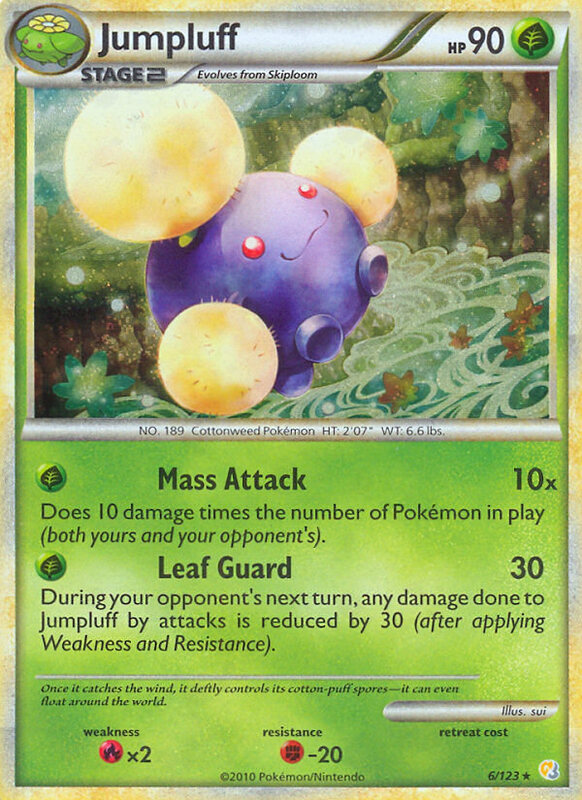 Palmer’s Contribution is our mass-recovery card, being able to recover a full Jumpluff line in addition to a few Grass Energies or whatever else I need. Finally we have Pokémon Rescue, which is quite an unusual addition to Jumpluff, but I like it a lot. 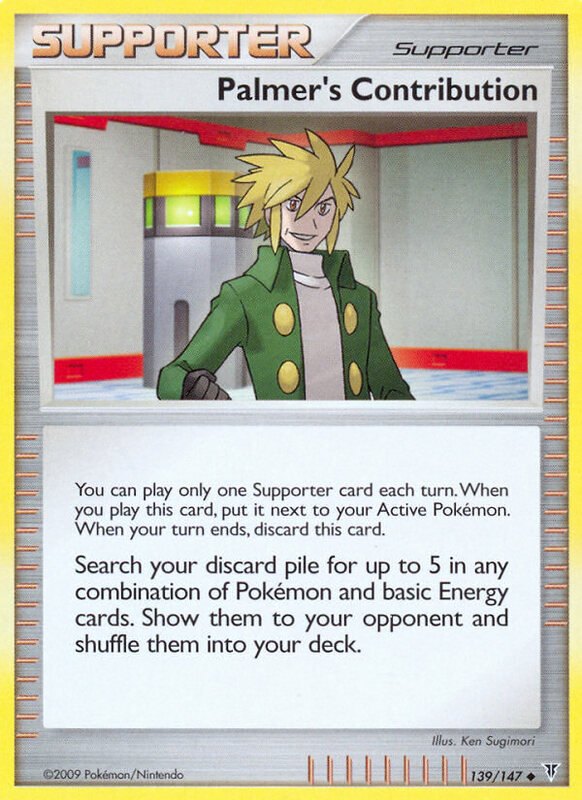 Not only does it provide yet another way to recover our Pokémon without using that turn’s Supporter, but it can help make up for our lack of running Azelf. I had considered adding Azelf to the deck, but I really didn’t like it. It was one of the worst starters the deck could get, wasted a bench space the entire game and in a lot of cases, it was a dead draw. While it doesn’t do much for me if something such as an Unown Q or Crobat G is prized, it does really help if any of of the three Jumpluff stages are prized because it allows me to recover the one that I need from my discard pile. Every time I write an article, I go on and on about how great Unown Q is, but until that changes, you’ll be stuck always reading about how amazing this card. Being able to give any Pokémon in the deck free Retreat cost is just too good. 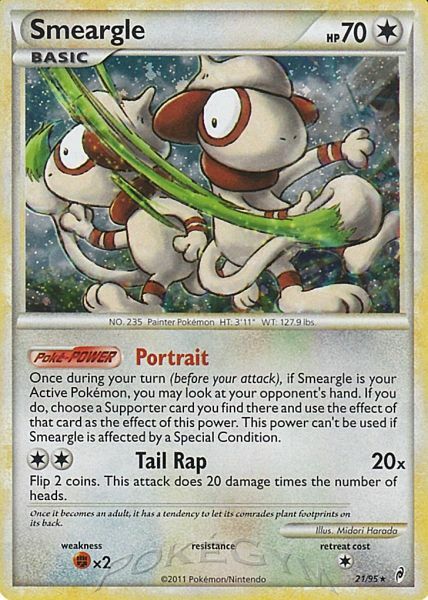 Not only does it do a great job at correcting bad starts, but it goes a long way toward making a Smeargle useful all game because I can keep using a Supporter card each time a Jumpluff is KOed (which happens quite often because of its low HP). All of these cards are staples in some deck or another. Pokémon Collector gets the Basics, Bebe’s Search nabs the Evolutions, and Luxury Ball does anything I need it to. Pokémon Communication not only acts as a 2nd and 3rd Luxury Ball, but it is great for making Pokémon Collectors drawn late game even more useful. I know when I talk about these four cards I begin to sound like a broken record, but what can I do? Judge is a very important card in every single one of my matches, especially SP and Gyarados. Being able to ruin a 10 Card hand AND break a Cyrus’s Conspiracy chain can easily win you the game. When you’re playing against LuxChomp in particular, both decks will typically be scoring a KO every turn, which means if you can stop your opponent from doing this for even one turn, it really increases your odds of victory. It is very similar in Gyarados. A big part of their strength will be recovering Gyarados after Gyarados. However, if they are unable to do so for a few turns, you really give yourself a big edge. 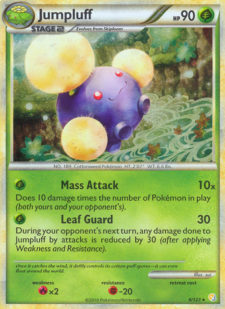 This card may seem outdated to a lot of players, but I believe that in Jumpluff it is still very useful. Since Jumpluff has such low HP, it is quite easy for your opponent to KO, meaning there will rarely be a turn where you won’t be drawing 8 cards each time you use it. Originally this slot was given to a Professor Oak’s New Theory, but after trying out Cynthia’s Feelings, I just couldn’t bring myself to switch back. Last but not least, the Grass Energy. Yuka ran six Grass Energies in her list, but that was when Roseanne’s Research was in the format as well, allowing her access to them much easier. While I had started out with eight Grass Energies, I eventually lowered it to seven and realized that it was the better play. To finish this article, I would like to talk about some of Jumpluff’s match ups and the chance you have of success. Note: Some of these decks aren’t too commonly played, but I would like to give my analysis on a variety of match ups, so that between your own play testing experience and this information, you should have no trouble figuring out how hard/easy the others are. I believe that when you’re playing against LuxChomp, so long as you don’t get a terrible start, you have a slight edge over your opponent. Being able to swarm out attackers just as fast as they can, they will have trouble keeping up with you unless if they fill up their bench, thus allowing you to score consistent OHKOs. PokeGymAlso, be sure to try and get a Smeargle + Unown Q up and running, even copying a Cyrus’s Conspiracy will let you get the exact Supporter you want to use next turn in addition to a Grass Energy. Judge is amazing here, one well timed one mid/late game can easily win you the match. Unfortunately, your opponent will have a slight edge over you, which is mainly because of Garchomp C Lv.X’s ability to heal Dialga G Lv.X. Traditionally, this would be a very difficult match up, but because you are much faster in setting up than your opponent, with the use of Judge and a little luck, you still have a great shot of winning. In most cases, this will be a very even match that will swing the game in favor of one player or another depending on how “Fainting Spell” flips go. Since this is VileGar, it will be very difficult for them to have less than four Pokémon on their bench, meaning Jumpluff can score OHKOs on Gengar. The only thing Gengar Lv.X gives your opponent is more HP since its attack and Poké-Power are near-useless. Trainer Lock can be a bit tricky, but if you can get a decent start, you can usually overwhelm your opponent before they can get set up. Again, this match up varies so much on luck that it’s almost impossible to judge it. While it should be about even, your opponent has the advantage of disruption. What saves us is the high Search count, which does wonders for helping us get an Uxie. Like all other SP match ups, if you can crush their hand with Judge, you probably should. Between your massive attack power and Fighting Resistance, Machamp will have a lot of trouble beating you. The only useful thing Machamp SF can do for your opponent is offering the possibility of a donk. When compared to Machamp SF, Machamp Prime is much more useful, but because it is so slow, it doesn’t pose a huge threat. Of the most popular decks, this will be your hardest match up. Since your Gyarados typically dishes out 90 damage, which is the magic number to OHKO Jumpluff combined with the fact that Jumpluff usually cannot OHKO Gyardos since they can function with only 3-4 Pokémon on their bench. However, what gives us a chance is our speed. While there certainly are times where your opponent can get a Gyarados swinging by as early as turn one, often times it won’t be attacking by as late as turn two, three or even four. 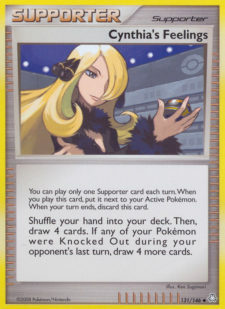 Again, a key Judge to stop your opponent from recovering a Gyarados can deliver you the win. While it is certainly a very difficult match up, it is by no means impossible. Most of the time, you’ll be able to win this match up because of your speed. While Rescue Energy won’t be very useful here, since Jumpluff is so fast and has such powerful recovery, you can usually overpower your opponent, even if they manage to get a Scizor with 3-4 Special Metals in play. After you manage to take out one big Scizor tank, the match is usually in the bag for you as Scizor can have a difficult time recovering. Of coarse, your opponent will be doing everything they can to prevent this by running cards such as Poké Healer +, getting a lot of Special Metal Energies on Scizor and using a lot of disruption. One thing I would like to mention, if your opponent is running a lot of disruption, getting 1-2 Sunflora in play is a good idea as it should give you the search power you need to continue setting up, even through Judges. While Gyarados is your hardest common match up, Steelix (which contains a couple Mesprit to lock your Poké-Powers early-game) is probably your most difficult match up overall. However, like most match ups, if you can outspeed them and KO Steelix before it can get powered up, you have a chance of winning. Traditionally, this would be a very interesting match up. Both decks are very fast and hit for big damage for low Energy. But, the problem that Donphan has is not only dealing with your Fighting Resistance, but that Jumpluff can hit for up to 100 damage (with Donphan’s Poké-Body) where in order to do 70 damage (with Jumpluff’s Resistance) it will take three Fighting Energies. Because of this massive attacking edge you have over Donphan along with more powerful recovery (most of the time), you can usually completely overpower Donphan. Be careful of the donk, however. Just like Machamp, if you only have a single starter Pokémon, there is a good chance they can kill it if they go second. Both Blastoise and Jumpluff can hit for massive amounts of damage. The difference between the two? While Blastoise has higher HP, making it much more difficult to kill, Jumpluff can do it for a single Energy opposed to the four required by Blastoise. Your opponent will try to remedy this by using Feraligatr Prime, but that will require your opponent to get a second Stage 2 in play not to mention the Energies. In addition, even if Blastoise does get powered up, Jumpluff can 2HKO it, meaning it won’t last long. Raindance is a very powerful deck, but it just can’t compete with Jumpluff’s speed and recovery. While Jumpluff isn’t as powerful or dominating as it was last format, it is still a very fast and powerful deck and, with a bit of luck, you can do very well with. I won’t try to pass it off as the next LuxChomp, but with a little luck, you’ll be defeating quite a few at your next tournament. If anyone would like some help constructing their deck for States, I’m always more than happy to help, just send an email to dstreck96@yahoo.com and I’ll be sure to get back to you asap. I really like this, trying to bring a good card back into the format, while still trying to keep its speed. However, I know some people have been toying with the idea of Jump-Plume (Jumpluff/Vileplume) and they say it works pretty well. Any thoughts on that matter? Yeah, I know that people have been toying around with JumpPlume a bit, so have I. I like it because Sunflora can search for the Vileplume pieces as well, so it helps with the overall synergy of the deck. However, it does loose a lot of the speed as well as a bit of the recovering ability that straight Jumpluff has. I always want to make JumpPlume but as far as this season goes, Gengar SF’s Fainting Spell is just too good to pass up while choosing between the two. Also, Level Down is crucial, it is the main reason VileGar wins tournaments. As for the regular Jumpluff, he is just too easy to KO. Every big deck in this format can one hit him, and those decks have alot more going for them. I played against a JumpPlume w/ Shaymin X in Top8 at a cities but I was running DialgaChomp so it was an easy matchup for me. Also, with alot of Palkia G X/Lost World ideas out there, while playing carefully, could limit your attack to 80.
have you thought about seeker, sure jumpluff, has low HP but it could work. P.S. I like your feed back on the lesser known matchups. yeah, I tried Seeker, but I didn’t like it because it reduced Jumpluff’s damage output by 10-20, depending on if you put the Pokemon on your bench again. what steelix list runs mesprit? Yeah, almost every Steelix deck I’ve played against in the past 4 months has run 1 Mesprit. I have come across a few that have run more than one, most do not, so I guess “a couple” was an error. Sorry about that guys! It’s been a while since someone has written about Jumpluff in this format, and I believe you did it justice. This has to be one of my favorite articles on SixPrizes.com. Great Job! good article, but why make a deck that will get pooped on by everything? stage 2 with 90 health that needs full benches on each side of the board to be any good? lol seems pretty bad. I have a friend who likes VictreePlume over VileGar because you can attack with Vileplume. You must be new. Jumpluff was a heavy hitter last season. A VERY heavy hitter. Most decks use full benches, it only takes 1 energy for it to attack, and the stage 2 sets up VERY fast with enough draw + Sunflora. i have been playing the game since jungle. LOL. The deck is useless in TODAY’S format. you just said so yourself “it was good LAST season”. If you’ve been playing the game since jungle, you should know better than to write off a deck from a previous season. I mean, look at how much g-dos came back. This deck may not be tier one, but it still has seen some top cuts in cities, and can absolutely win against anyone not expecting it. I myself have been playing for almost 10 years now. While Jumpluff isn’t the force it was last format, it is still a very powerful and fast deck that is a force to be reckoned with. My son is in Juniors and is interested in playing Jumpluff. Do you think it is a reasonable play in Juniors for a Provincial tournament? He’s not a super competitive player, but did reasonably well at Canadian Nationals last year (came in around 16th). It doesn’t have to be BDIF, but I also want him to have a good chance of winning more than he loses. yeah, if you two can come up with a consistent list that fares well in testing, go for it!